A woman is in critical but stable condition and a man is in stable condition following a fire that destroyed an Esquimalt house Wednesday night. The woman is in the intensive care unit of Victoria General Hospital, while the man is at Vancouver General Hospital. Both are in their 60s. Neighbours say the couple — whom they said are named John and Helen — had lived at the home at 662 Admirals Rd. for about three months, but did not own it. The homeowner was not injured in the fire. Esquimalt firefighters will likely begin their investigation into the cause of the fire tomorrow morning, fire chief Chris Jancowski said, but are waiting on a structural review to determine if it’s safe to enter. No damage to neighbouring buildings was reported, he said. 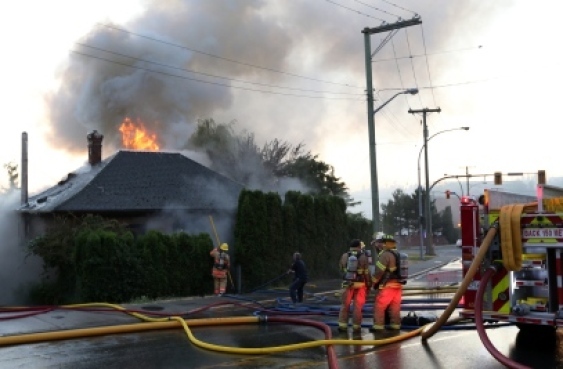 Smoked and flames continued to pour from the roof of the Esquimalt home Wednesday night, more than an hour after the couple was taken to hospital. Sidney Langhelt called 911 at about 8:30 p.m. after seeing smoke as he approached the house on his bike. “The house was smoking pretty good and there were actually flames showing at the rear of the building. There’s a camper back there,” he said. After calling 911, he tried to enter the house but couldn’t. “The windows were too hot, building walls were too hot. 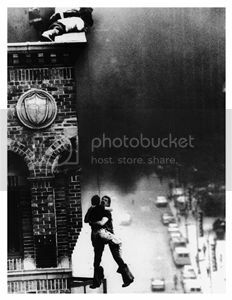 It would be too dangerous,” he said. A bystander said Esquimalt firefighters kicked down the door and carried out a woman, then a man. Dena Dawn Leggett identified the couple as John and Helen, saying they moved out of her apartment building down the street three months ago. She didn’t know their surname, but said Helen used a wheelchair, had recently had a stroke, and was blind. They didn’t own the house that was on fire, she said. Leggett said she couldn’t tell the couple’s condition as they were taken from the house.